Everybody loves Buddy Ebsen. And we all know that he was supposed to be the original Tin Man in the “Wizard of Oz”; only leaving the role due to an allergic reaction to a very stupid choice of pure aluminum powder for makeup. 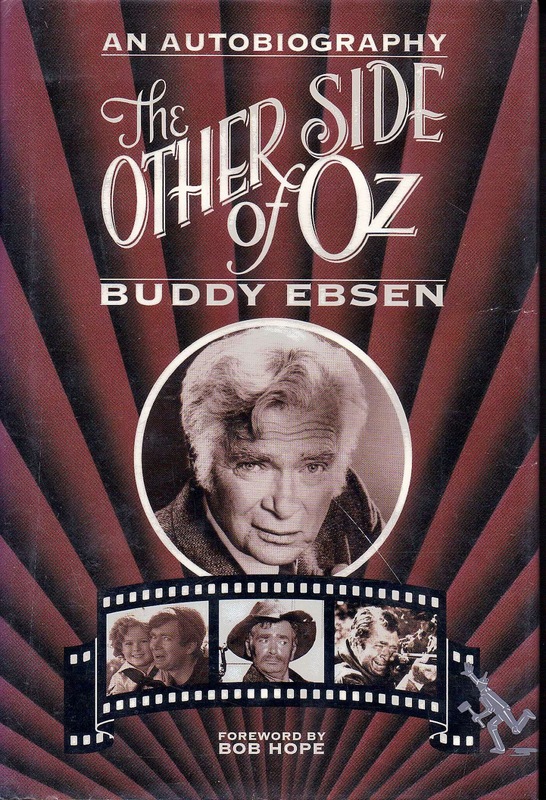 But the full story of Buddy Ebsen’s life and fabulous career is rarely told. And, who better to tell it; in that inimitable style of his; than Buddy Ebsen. Born in 1908 Mr. Ebsen was one of those lucky enough to have a career in vaudeville, silent films, talkies and then television. Alone at first, and then with his sister Vilma by his side, he played in several shows on Broadway, and even in the Ziegfeld Follies. There is so much of Mr. Ebsen’s personality in these pages; it’s like having your grandfather talking to you; especially if you read it like Barnaby Jones. His chapter on the film he did with Shirley Temple was very timely; Ms. Temple passed away just as I finished reading it. His description of her as a very sincere child ring true to what I have read elsewhere. She was slated to play opposite him in “The Wizard of Oz”, but a scheduling conflict with the other studio made it impossible. Mr. Ebsen is philosophical about it all; including his own problems associated with the film; dismissing it as a stroke of luck. So many of the people involved in that film were the victims of “bad luck” later on in life that he feels almost as if he and Ms. Temple may have both “dodged a bullet”, so to speak. Even Margaret Hamilton; the Wicked Witch of the West; was the victim of severe burns on the set. This type of thinking concerning fate appears several times throughout the book, as when he encounters Max Baer at a Championship fight in the late 1930’s. In describing the incident he marvels that he was interacting with a man who would later father the child who would not only appear with him in one of his greatest commercial successes, but would also save his life. I won’t spoil that one for you; let’s just say it’s worth the read. His experiences trying to get in the Navy, and finally settling with the Coast Guard; before winding up in the Navy anyway; are an excellent example of the futility in trying to deal with the government. There was a war on, Mr. Ebsen wanted to fight for his country, yet he couldn't get in! Only after he gave up trying did he get to serve. And then it was on a weather ship off the NW coast of the United States, where he served as Executive Officer aboard the USS Pocatello. He spent a couple of years sending weather balloons aloft in defense of freedom. This was actually good preparation for his later role on Broadway, where he played the hapless Mr. Roberts, a Navy Lieutenant who was just dying to get off his cargo ship and into the war. Most people remember Henry Fonda in that role, but Mr. Ebsen played it first. Still, this experience was the culmination of his boyhood love for the water, and the springboard to a lifelong love of yachting and racing. After the war came his only real lack of steady employment in the entertainment business. With the advent of TV came the decline of Vaudeville. Broadway was in a new heyday, but with fewer shows than there had been pre-war. At one point he was reduced to one night stands as part of a 3 act show in movie houses in Brooklyn. This was the lowest point of his career. After having played in the Ziegfeld Revue and alongside some of the best acts in entertainment history, this was the point at which he almost gave it all up. But then along came Disney. His role alongside Fess Parker; who wound up playing the title role originally promised to Mr. Ebsen; made him “hot” again, and he began to get offers from just about every TV show around. He even got to do his dance routines again for a new audience. Then came the guest spots on programs such as The Andy Griffith Show, where he played a vagabond who has a bad influence on Opie. To prevent the boy from idolizing him too much, he does something very bad; but also very brave; in order to bring the boy back in line. Within a year of that episode he was in front of the camera, starring as the straight man in Paul Henning’s award winning “The Beverly Hillbillies”, which ran 9 years. This show featured Max Baer, Jr., the son of the boxer previously mentioned. He really does save Mr. Ebsen’s life during the filming of one particular episode. The only hint I’ll give you is that it happened during the filming of one of the “Double Naught Spy” episodes. This book was an unexpected surprise which came to me while wandering the “stacks” at the library in Mooresville last week. Beautifully illustrated with photos from the authors own collection, this is a book for fans of Broadway, vaudeville, movies and television. And, even if you don’t like The Beverly Hillbillies, you will find much to like about this book.